Summary: Learning how to manipulate inflammatory conditions could help to develop new therapies to stimulate neurogenesis and protect against Alzheimer’s, a new study suggests. Study suggests zebrafish might teach us how to tackle Alzheimer’s disease. The Aβ42 deposits triggered a special inflammation-related signaling pathway that ultimately lead to enhanced neurogenesis, i.e. new neurons were built. NeuroscienceNews.com image is credited to Kizil et al./Cell Reports 2016. In the current study, the Dresden-based neuroscientist and his co-workers succeeded in mimicking symptoms of Alzheimer’s disease in zebrafish brain. Conditions were triggered by Amyloid-Beta42 (Aβ42) peptides – one of the major contributors to the disease in human brains. Similar to our brains, Amyloid molecules accumulated in the neurons of zebrafish leading to immune response, synaptic degeneration, cell death, learning deficits and other dysfunctions. “This is the first time, such conditions have been generated in adult zebrafish through Aβ42 deposits”, Kizil says. Funding: This work was supported by the Israel Science Foundation, the European Research Council, the Yeda Sela Center for Basic Research, the British Heart Foundation and the European Union, Seventh Framework Programme, Marie Curie Actions. Image Source: NeuroscienceNews.com image is credited to Kizil et al./Cell Reports 2016. DZNE “Tweaking Immune Response May Be a Key to Combatting Alzheimer’s.” NeuroscienceNews. NeuroscienceNews, 17 October 2016. DZNE “Tweaking Immune Response May Be a Key to Combatting Alzheimer’s.” http://neurosciencenews.com/immune-response-neurodegeneration-5325/ (accessed October 17, 2016). Human brains are prone to neurodegeneration, given that endogenous neural stem/progenitor cells (NSPCs) fail to support neurogenesis. To investigate the molecular programs potentially mediating neurodegeneration-induced NSPC plasticity in regenerating organisms, we generated an Amyloid-β42 (Aβ42)-dependent neurotoxic model in adult zebrafish brain through cerebroventricular microinjection of cell-penetrating Aβ42 derivatives. Aβ42 deposits in neurons and causes phenotypes reminiscent of amyloid pathophysiology: apoptosis, microglial activation, synaptic degeneration, and learning deficits. 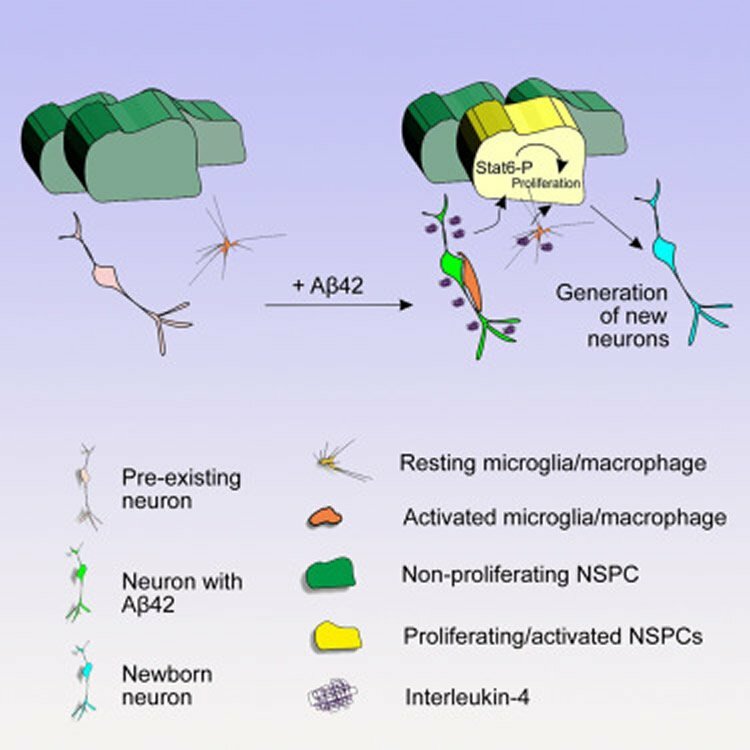 Aβ42 also induces NSPC proliferation and enhanced neurogenesis. Interleukin-4 (IL4) is activated primarily in neurons and microglia/macrophages in response to Aβ42 and is sufficient to increase NSPC proliferation and neurogenesis via STAT6 phosphorylation through the IL4 receptor in NSPCs. Our results reveal a crosstalk between neurons and immune cells mediated by IL4/STAT6 signaling, which induces NSPC plasticity in zebrafish brains.